Cross-country skiers enjoyed powder skiing in Michigan’s Upper Peninsula last weekend. But snow levels were much lower over Thanksgiving weekend at West Yellowstone, Mont.—where snow usually is abundant over the holiday. Nevertheless the USSA West Yellowstone SuperTour races at the 7,000-foot-plus altitude went off famously last weekend for 264 Nordic racers Friday and Saturday, Nov. 23-24. There were 27 Sun Valley Ski Education Foundation current racers or alumni racers taking part. Low snow on the Rendezvous Ski Trails caused organizers to change the sprint format from full sprint rounds to a prologue. Snowmobile trails on the South Plateau just weren’t wide enough for full sprints, according to Fasterskier.com. So, on Friday they raced an individual start 9-kilometer point-to-point freestyle race. It started from about 7,260 feet above sea level and gained only about 300 feet from start to finish on rolling terrain, but the course was a challenging one. On Saturday there was a 1.6k point-to-point prologue. Top SVSEF finishes were: Chelsea Holmes second of 105 women in the 9k women’s skate, just five seconds off Rosie Brennan’s winning pace; Matt Gelso and Mike Sinnott placing 2-3 in the men’s 9k; and Sinnott’s fourth in prologue. 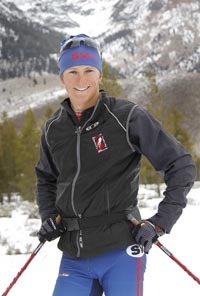 Gelso, 24, is the former University of Colorado All-American cross-country skier from Truckee (Ca.) High School and the Auburn Ski Club. Also, 19-year-old SVSEF racer Kevin Bolger won the Older Junior class of Saturday’s 1.6k prologue race; former SVSEF racer Sloan Storey, 18, was the second OJ in women’s 9k; and 17-year-old Laurel Fiddler won the J1 9k. Race winners in the 9k freestyle were Alaska Pacific University’s Brennan, 24, her first SuperTour win in nearly six years, and Boulder Mountain Ski Tour king Matt Liebsch, 29, of Orono, Minn. by six seconds over Sun Valley’s Gelso, 24. Prologue winners were Vail’s Ryan Scott, 23, a first-time winner just a day after he placed 78th in the 9k individual start freestyle, and Stratton Mountain School’s Sophie Caldwell, 22, from Vermont. In her first race as a professional skier, Dartmouth College’s Caldwell won by a full five seconds over McCall’s Anika Miller, 17, a senior at Idaho’s McCall-Donnelly High School who attended Stratton Mountain last winter. The FIS-sanctioned West Yellowstone SuperTour races had no bearing on U.S. team selection for December’s World Cup sprints in Quebec, Canada. But they were excellent training milestones for the Bozeman SuperTour freestyle and classic sprints this week that will be the World Cup qualifiers. Coming up at Bohart Ranch near Bozeman, Mt. : Freestyle sprints Thursday, Nov. 29; classic sprints on Friday; and mass start classic races (10k women, 15k men) on Saturday, Dec. 2. The Bridger Ski Foundation is organizing the event. ( Saturday, Nov. 24, women’s 1.6k prologue: 1—Sophie Caldwell, 22, (Stratton Mtn. School) 3:33.19. 14—Chelsea Holmes, 25 (SVSEF) 3:45.91. 22—Alexa Turzian, 24 (SVSEF) 3:52.22. 29—Maranda Stopol, 18 (SVSEF) 3:57.48 (4th OJ). 36—Maggie Williams, 17 (SVSEF) 4:02.40 (7th J1). 51—Katie Feldman, 16 (SVSEF) 4:16.40 (62 finishers). ( Saturday, Nov. 24, men’s 1.6k prologue: 1—Ryan Scott, 23 (Ski and Snowboard Club/Vail) 3:00.96. 4—Mike Sinnott, 27 (SVSEF) 3:03.69. 9—Reid Pletcher, 24 (SVSEF) 3:06.21. 15—Matt Gelso, 24 (SVSEF) 3:09.12. 17—Patrick Johnson, 23 (SVSEF) 3:09.64. 30—Kevin Bolger, 19 (SVSEF) 3:13.39 (1st OJ). 59—Nicholas Lovett, 18 (SVSEF) 3:24.41. 61—Luke Costley, 18 (SVSEF) 3.25:23. 71—Cole Greenberg, 16 (SVSEF) 3.28:74. 110—Omar Bermejo, 30 (SVSEF) 4:51.32 (112 finishers). ( Friday, Nov. 23, men’s 9k freestyle: 1—Matt Liebsch, 29 (Borton Volvo XC United) 21:03. 2—Matt Gelso 21:09. 3—Mike Sinnott 21:11. 9—Patrick Johnson 21:40. 32—Reid Pletcher 22:29. 82—Nicholas Lovett 23:52. 83—Scott Phelan, 21 (Montana State) 23:53. 86—Kevin Bolger 23:58. 95—Jake Adicoff, 17 (SVSEF) 24:23 (6th J1). 108—Cole Greenberg 24:46. 110—Ketchum Wilt, 18 (SVSEF) 24:56. 114—Jack Steele, 19 (Middlebury College) 25:08. 116—Luke Costley 25:16. 122—Andrew Graves, 17 (SVSEF) 25:44. 159—Omar Bermejo 34:27 (159 finishers). ( Friday, Nov. 23, women’s 9k freestyle: 1—Rosie Brennan, 24 (Alaska Pacific) 24:36. 2—Chelsea Holmes 24:41. 11—Nicole DeYong, 30 (SVSEF) 26:01. 12—Alexa Turzian 26:02. 23—Annie Pokorny, 20 (Middlebury College) 26:46. 26—Sloan Storey, 18 (Univ. of Utah) 26:54 (2nd OJ). 28—Laurel Fiddler, 17 (SVSEF) 27:02 (1st J1). 51—Maggie Williams 28:07. 52—Maranda Stopol 28:14. 64—Carrie Heagney, 21 (Montana State) 28:59. 79—Jesse Knori, 18 (SVSEF) 29:52. 87—Katie Feldman 30:35. 94—Haley Montgomery, 16 (SVSEF) 31:31. 98—Sarah Williams, 17 (SVSEF) 32:28 (105 finishers).